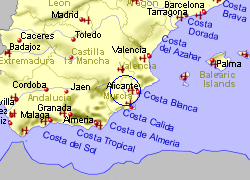 This is a large agricultural town at the northern gateway to the Valley of Ricote, where peaches and olives are produced and is the capital of Vega Alta, which includes the towns of Abaran and Blanca. 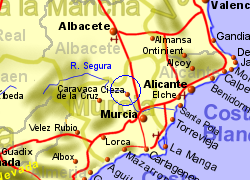 It has many shops, bars and restaurants with a market held every Wednesday, and is surrounded by mountains with the River Seguro passing by the town. 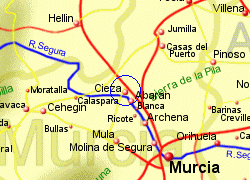 Map of the Cieza area.